What are the pros or cons of one solution strategy over another? Consideration stage content aims to answer these questions and dive deeper into specific solutions. Ideally, the answers to those questions will steer the right people, those that fit your personas, toward the solutions you offer. Creating information that compares and contrasts solutions should help people decide which one works best for them. That may not be the one you offer, but that's okay. It all comes down to helping people. If someone has learned from you, even if they don't do business with you now, it can pay off later. Creating content that might exclude some people may seem counter-intuitive at first, but the long-term goal of content marketing is to bring highly qualified leads to you. If what you offer isn't a good fit for someone, that person isn't likely to have a good experience if they choose your solution. So what formats work well as consideration stage content? What do all these formats have in common? They allow for a deep dive into solutions. A prospect is in the consideration stage, with a defined their problem or opportunity, is more likely to invest time in research. Longer formats that explore details of various types of solutions are well suited to help people learn at this stage. They are looking for details and instruction. 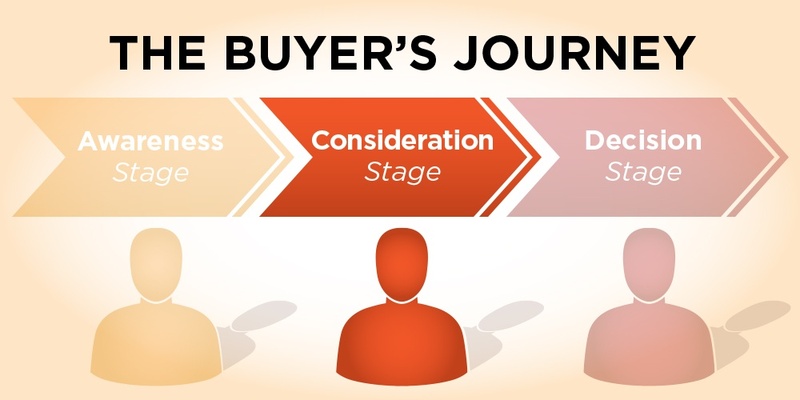 Download Your FREE eBook "Content Marketing for The Buyer's Journey"
How does consideration stage content work in the wild? Take for example a company that has decided that getting more leads is the right path to grow. There are lots of ways to get leads. Paid advertising, phone calls, inbound marketing, and even direct mail are just a few. Consideration stage content can help point out the pros and cons of each method. Which one might work best for a particular market or persona? As a person learns from consideration stage content, they will eventually come to an informed decision. One solution strategy will emerge the winner in the debate over which one is best. Perhaps a solid pay-per-click (PPC) campaign is the best route to generate leads quickly. If the business is stable and the goals are for a high return on investment over a more extended period, an inbound marketing strategy might be the best solution. The key is that consideration stage content helps people make a decision. One solution strategy, or even a mix of them, is what they are trying to determine. Information at this point should still be educational and not push too hard for the sale. It's not about you at this point. Someone trying to decide on strategy may not be ready to commit to one company that delivers one approach. Once a person decides which strategy is best, that person is in the decision stage. At this point in the process, prospects will evaluate specific solutions to solve the problem. If a company has decided that an inbound strategy works best to gather leads a choice still needs to be made. Who do they work with to put this plan in place? Do they work to do it on their own? Do they hire an agency? Do they bring in a consultant? This stage is the time and place for you to show why you're the best choice. In our next article, we'll explore decision stage content and how it can help you close the sale. Don't miss the other two parts of the series: Part 1 and Part 3. Download this series of articles in a detailed eBook format!